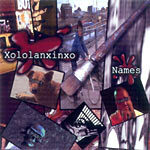 Second new album by Xololanxinxo (OMD) made for the Creative Differences tour with the Legends in 2003. He kills it with this 11 track heater beatmined by Deeskee. No guests, but I can't say enough about this album. Beautiful and funky beats, dope stylings and words, put this album on and enjoy life and hip hop on a whole. Also peep out his other album, People Kill the Person! CDR. Share your thoughts with us! Write your own review.